Et voila – M. Yo Sur Un Éléphant: Évidence Photographique Indéniable! Naysayer….Naysayer….not me! 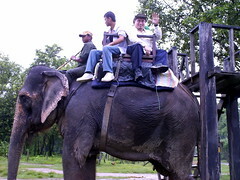 I just wanted to SEE you on an elephant…that is all! No more. I mean geez…. Hey Sean! There’s a picture of you, and you’re on an elephant! WOW – an Oliphant – but if I do say so myself, that poor thing looks like it has had a rough road to travel over the years. I say burn incense and ask for forgiveness…and for it to have an early retirement with lots of peanuts.